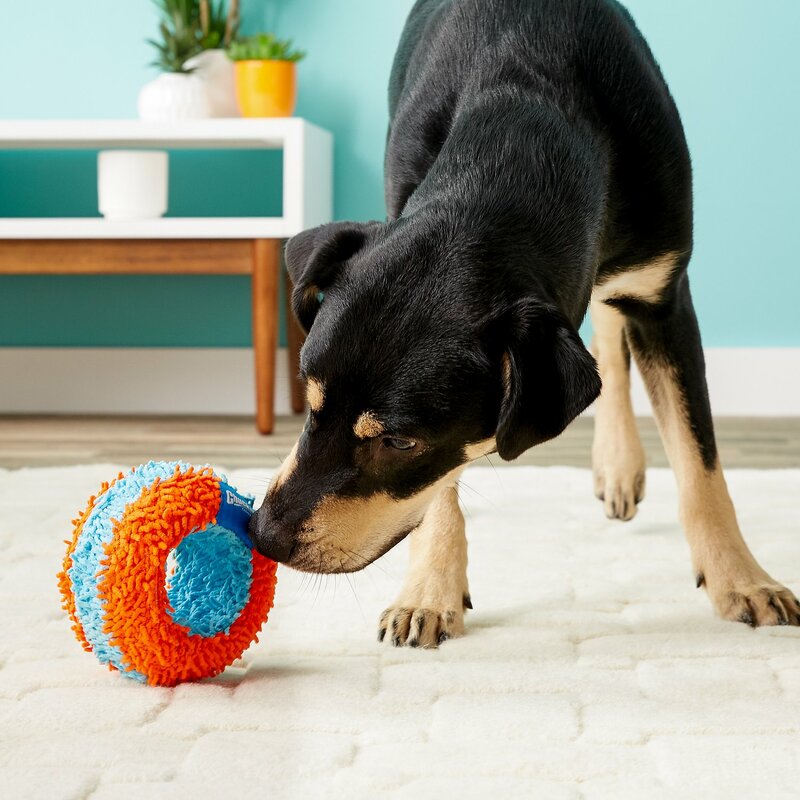 Send your pup scampering around the house while he chases his new favorite indoor toy. The Chuckit! Indoor Roller is made just for inside play, designed to roll around the floor when flung from the Indoor Launcher, or to be pounced and chewed when you kick it across the kitchen. The soft construction makes rainy days just as fun-filled as a trip to the park. I did have to chuck it! My Boston Terriers had this torn apart in 10 minutes and my concern we the foam that was under the your. This is not a toy for chewers. I am sure it would work with dogs that don't like to tear up toys. Ben, a long-legged lab mix, and Charlie, a border collie mix, love to play catch and fetch both inside and out. I purchased all of the Chuckit indoor products. My boys LOVE the Tumbler, Football, and big Round Ball and play with them all but they don't care for the Roller. The middle (blue hole part) is very hard which is probably why they don't care much for this toy. 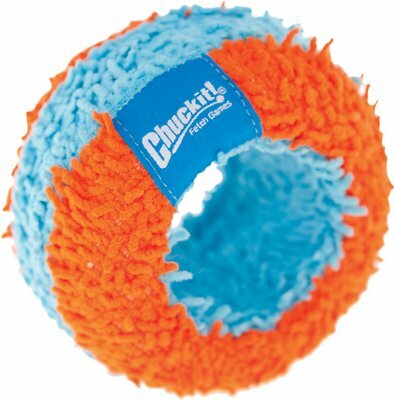 The other indoor Chuckit products I purchased are softer and easier for them to squeeze. This has been such a fun toy for Kona. Since it has been so cold outside, these indoor chuck it toys have really helped alleviate a lot of Kona’s cabin fever. These indoor chuck it toys are very light weight and softThey are also surprisingly durable and strong. This is my dog, Mekka's favorite toy. She finally wore one out after playing with it for many years. Glad I could find her another one. My dogs love this toy. Lightweight so able to play fetch in the house without destroying anything inside of it. Perfect for them. She loves it, I hate it! Our one-year-old bulldog absolutely loves the soft chuck it balls. I thought this would be a good toy to take a break from the ball. She loves it! It has held up well like the balls, and we do have a tough chewer. The only problem is she shoves it under everything, and it is impossible to get out from under the sofa and ottoman which drives me crazy. I think it's her favorite game to play. My dog has shown no interest in this toy. She gets irritated because it is hard to get her mouth around and doesn’t roll well!